First order of business for the morning was breakfast. It wasn’t included with the hotel, but the first level was home to a diner that had pretty good reviews. 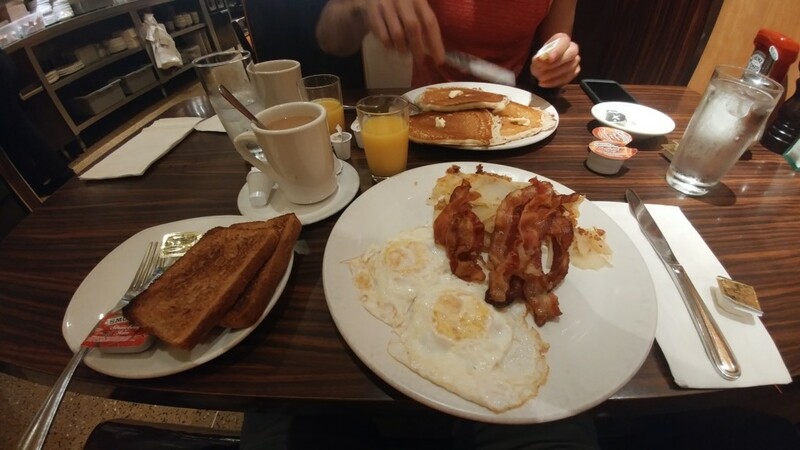 We found ourselves eating traditional American breakfast food, in traditional American portion sizes–far larger than any breakfast we encountered in Europe outside of the buffet in Berlin. After breakfast, we wandered over to Central Park. Since I grew up in a small town laid out over 120 years ago by Frederick Law Olmstead, I had a particular interest in seeing what is perhaps his most famous project. A little over two miles later, we stopped back by our hotel room, and crossed 95th Street to enter the subway station. Entering was maybe a little bit disappointing. While this station opened on the IRT’s opening day, October 27, 1904, the modern entrance is a headhouse built in 2010. Definitely disappointing is the fare structure for the subway system, especially for a tourist. Instead of paying a rate that corresponds to the distance you travel, like many other systems (including Washington, DC), NYC uses a flat rate and doesn’t track where you exit. This means that if we want to travel a few stops, we’re paying the same as a cross-town trip. The rate reflects that. At the fare station, we had the option to pay for a single trip at $3.00. Or, we could buy a MetroCard for $1, and get a discounted rate on each fare. Someone didn’t think it through though, as we couldn’t add an even multiple of $2.75 rides. They also sell an unlimited 7-day pass, but unlike Copenhagen or Vienna, we couldn’t buy a 1-day pass. At $32, the unlimited 7-day pass didn’t make sense, especially considering it didn’t include the AirTrain to JFK where we’d catch our flight to Cincinnati. Getting to the platform was a short escalator ride down. As this was one of the original stations, built using cut-and-cover methods, the line runs just below street level. Fortunately, the recent renovation included removing mid-century tiling, with original 115-year-old stuff exposed and restored. On the platform, little had changed since 1904. The trains still operate at the same speeds too–Google couldn’t tell whether we were walking or on the train, even though we were on an express train. We got off at the Times Square station, and did most of our midtown touring on foot. The subway was just too expensive and slow. 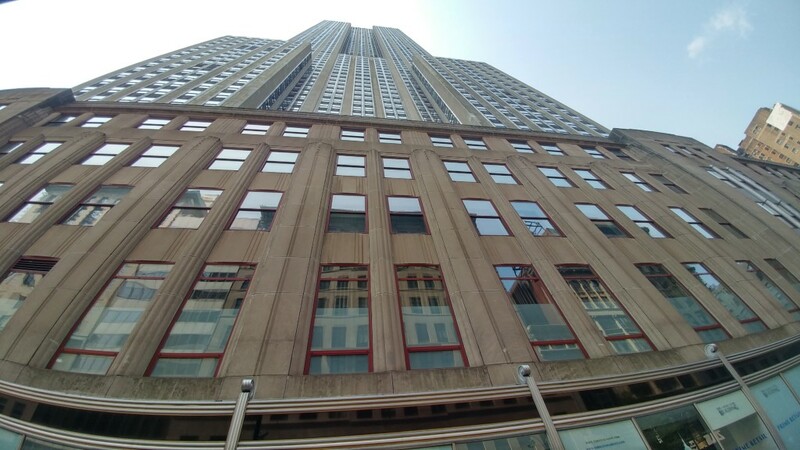 Among other things, we went to the Empire State building and Grand Central Terminal, before heading back to our hotel to grab our bags and check out. Empire State Building from street level. 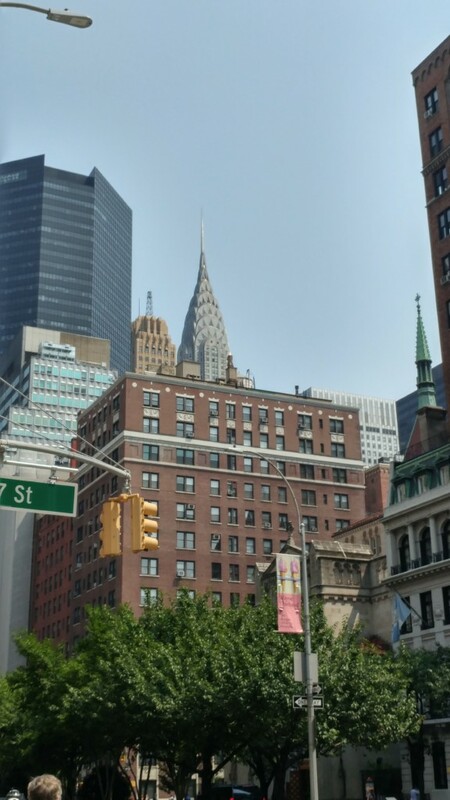 Chrysler building from a few blocks away. Interestingly, the building leases the land it sits on from Cooper Union, for more than $30 million a year. 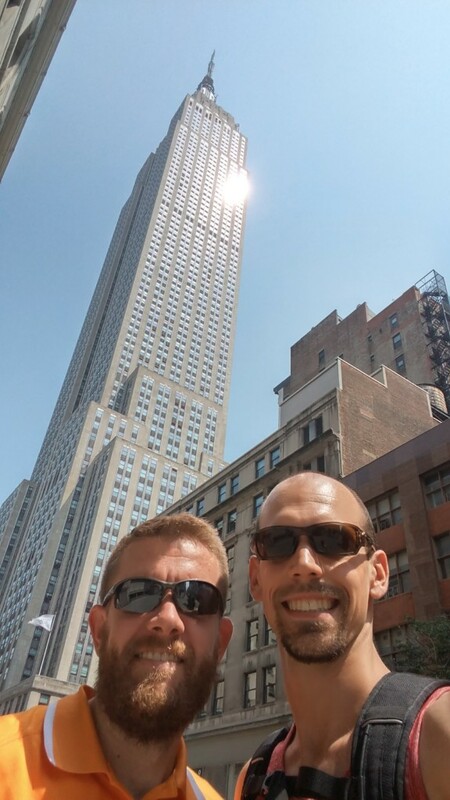 David and Andrew with the Empire State building in the background. From there, we headed to the west side for lunch, saw a few other sights, grabbed a drink at a historic bar, and started plotting our route to the airport. Lunch at Eva’s Kitchen was very good, and pretty inexpensive. 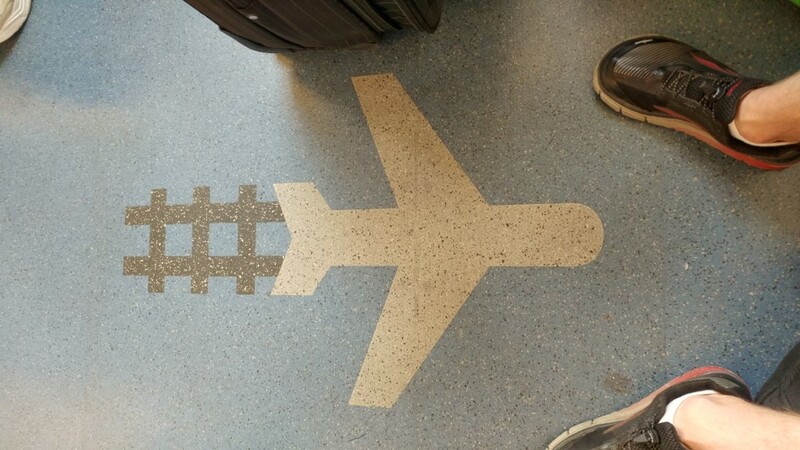 There were a number of options to get to the airport, but none were particularly fast. We needed to get to the Jamaica station to catch the AirTrain, but taking the subway would have been close to two hours in transit. Considerably faster, but also more expensive, was taking the subway to Penn Station, then the Long Island Railroad to Jamaica, and the AirTrain from there. Total cost for the trip was $18 each–$2.75 for the subway ride to Penn Station, $10.25 for the LIRR ride, and $5 for the AirTrain. You can buy a Metrocard that works for all three, but not the Metrocard that’s sold at other stations. We had to get a new card (no card fee at least) at Penn Station. After riding the subway, the LIRR train was a step forward in time. Padded seats, large windows, and air conditioning stood out. Once underway, LIRR staff made their rounds to punch our fare cards. The trip to Jamaica took about 45 minutes total, including the time at Penn Station. It was a short walk from there to the AirTrain platform, which is actually pretty modern. It’s fully driverless, and gets as fast as 60 mph. It’s kind of unique in that it runs 8 miles, connecting to points beyond the airport, but also serves as the shuttle between terminals within the airport. Floor on the JFK AirTrain. This might have come out of the business my parents own and operate in North Carolina. We were flying Delta, out of gate C60 in Terminal 2. This terminal was opened in 1962, and like Newark, the carpet looked like it could have been original. We stopped by the ticketing counter to see about changing our seats so we could sit together, and got prompt, courteous service from the Delta agent. The same couldn’t be said of the TSA officials working to screen passengers and luggage. It wasn’t that busy, and there were plenty of people working. But I have never, ever, in hundreds of times previous, seen a crew so disorganized and unattentive. I’m pretty sure bin Laden could have rolled a bomb through with a Gatling gun on top and none of them would have noticed. That wouldn’t have been so bad, except that they were regularly grabbing bags aside for additional screening. Andrew and I were in separate lines, but both had bags set aside. But they were set aside with no one tending to them. The supervisor was busy chatting with two or three agents at times, seemingly joking about something and teasing each other. The rest were mostly looking around, clueless as to what needed to be done. Keep in mind the checkpoint wasn’t very busy. When we arrived, there were no more than 20 people ahead of us, and I think nine TSA agents working. As my bag sat on a table, we had already been at the checkpoint 30 minutes. Eventually, I said something. An agent walked over to my bag, and handed it to me. No look inside, no swabs, nothing. Just an absolute waste of time. Eventually Andrew got his stuff too, and we were inside the rather small and crowded seating area. Since security took so long, we didn’t have a whole lot of time. I saw a Wendy’s, and thought I’d get a drink. Sticker shock outweighed my desire to get a drink–nearly $5 for an ordinary Coke. We were frustrated, but soon on our way. Again, no complaints with Delta, but JFK needs to do better. After landing in Cincinnati, my little brother picked us up. Milo was happy to see us, and after a 30-minute drive, we were back to his place and asleep soon afterwards. But the trip isn’t over–tomorrow is Friday, and after picking up suits from a dry cleaner, we’re all headed to Jackson, Tennessee for a wedding.